Strengthening the legs - the quad and calf muscles in particular - is made easier through a series of barre exercises, according to one leading Australian Pilates studio owner. This is the best full body workout around because it's affecting your core as well as the legs. Instructor Tamara Gollan, of Inner Strength Pilates in Australia said simple leg strengthening exercises were a regular request she received from clients at her Adelaide studio classes. In response to those demands, she has produced a sequence of barre exercises in a blog post titled, Adelaide Barre Workout - How to Tone and Strengthen your Legs. No actual barre is required to perform these exercises which, Gollan maintains, are excellent for strengthening the calves in the legs, the quads and the body’s core as a whole. The former dancer explains: “The exercises are intense and certainly provide a challenge. But that’s a good thing as our clients really enjoy pushing themselves – chiefly because they know the result at the end will be well worth the effort. Gollan’s exercise, outlined in the video Adelaide Barre Workout - How to Tone and Strengthen Your Legs involves positioning the body into a squatting position with the feet apart. It’s then a case of stepping forward with one foot while ensuring the legs remain far apart. Next the hands go on the hips and the heel of the back foot lifted up slightly while the toes remain on the floor. The object is to keep the core solid and stable while lengthening out through the crown of the head. Splay the toe on the front leg and lift the heel up; breath out to put the heel back down onto the floor again. The lower the back leg to the floor, the tighter the legs are worked. Gollan advises repeating this movement 15 times. A second exercise using the same position, is to bounce slightly on the back knee for up to 20 reps, again ensuring that the hips are evenly balanced and the body is upright and lengthening through the head. The position of the legs should then be swapped. The exercise should start to cause a burning sensation in the quads Gollan says but for those who find it too tough there is a ‘softer’ alternative. “If it’s too hard on the toe, you can place that foot back down, she says. “Then step together, step back, repeat on the other side. Its common sense that the more reps you do, the stronger your muscles are going to become. 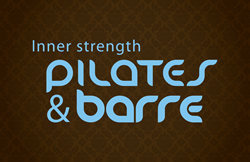 For more strengthening exercises and information on the benefits of Pilates and Barre see http://www.pilatesinnerstrength.com.au. A class schedule is available is also available on the site.